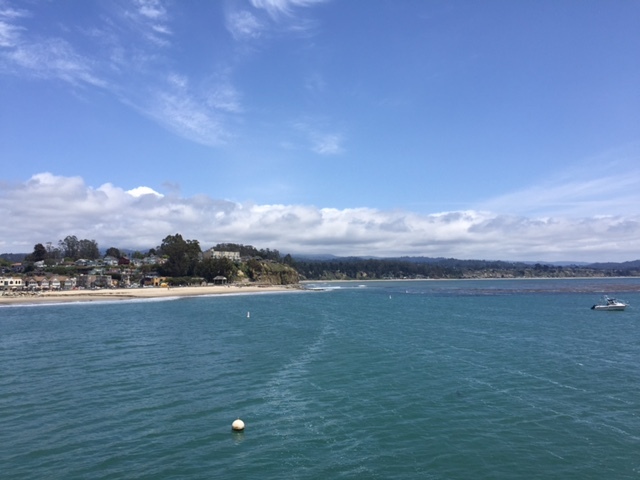 Napa Valley Vegan’s Roadtrip to Capitola! When my husband Steve and I first got together almost 15 years ago, our vacations revolved around beaches, drinking, eating and (for me anyway) lots of sunbathing! Back then, I was still in my early 30s and still looked good, felt good and could “bounce” back from my excesses! As we got to know each other and grew together, our lifestyle and vacation habits began to change. We began to learn about healthier choices and started to make better decisions in our day to day lives and our vacations. I also began to see the signs of 30 plus years of sun damage to my skin…Our vacations still revolve around beaches but now you’ll see me wearing an enormous sunhat and protective clothing enjoying the shade created by my giant beach umbrella! And if I go for that second vodka martini I’m done for the evening. Eating, though? That has remained an important part of our get-aways. Now we choose our destinations based on their vegan-friendliness and relaxation factor. Living in Napa, I am already fortunate enough to live in one of the most beautiful parts of the country. I have access to the entire San Francisco Bay Area which is absolutely breathtaking. 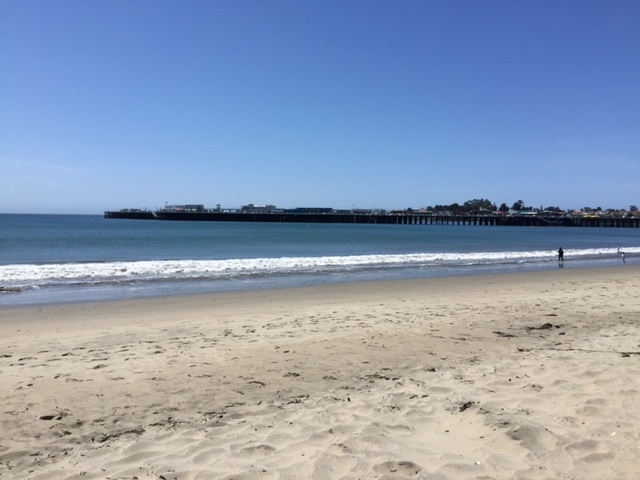 But having heard so many wonderful things about Capitola, a charming beach town in Central California, I decided it was time to do some exploring! I put the top down on my convertible and headed south! I love San Francisco but quite frankly I don’t ever really feel like my holiday has begun until I am somewhere I don’t recognize. 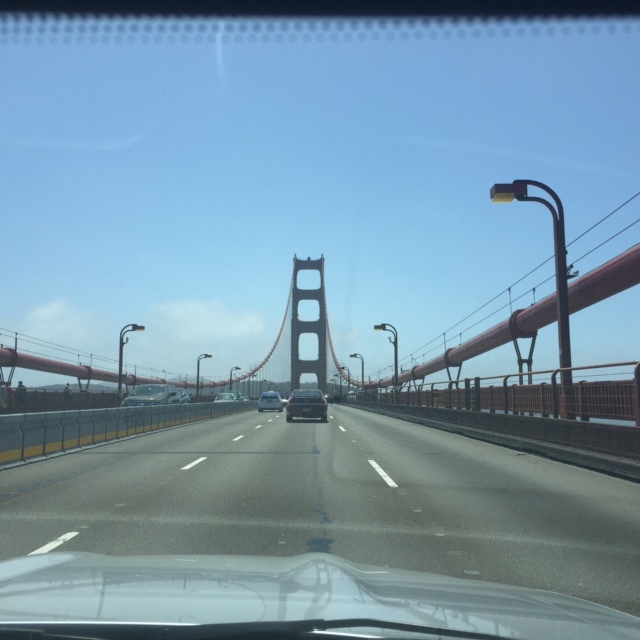 So the most exciting part of driving through the city was passing over the Golden Gate Bridge. That stunning view always makes me smile! And though there are shorter routes to take, I had to travel down the coast and experience Highway 1. Once the city was behind me, the views just got more and more amazing and I felt like I had really gotten “away”! I had my first stop in beautiful Pacifica and then a quick, late lunch in Half Moon Bay. I’m going to warn you fellow vegans, this is not a particularly vegan-friendly town. But as I have mentioned before, I am a complete bulk section geek and knew I would be stopping to check out New Leaf Community Market so decided to work my lunch stop in too! New Leaf is a community market that was founded in the early 80s by Scott Roseman as a funky, organic-friendly co-op that has now grown to seven stores. What had me so excited about stopping in is that New Leaf Community Markets is the first grocer in the state of California to be certified as a B-Corp. What is a B-Corp you ask? Well, let me tell you! It is essentially to businesses what Fair Trade is to coffee. To be certified, they were required to meet rigorous standards of social and environmental performance, accountability and that word we see so seldom of these days – transparency! Look out Whole Foods, you have got some serious competition. There are now over 1,000 B Corps spread across 33 countries in over 60 different industries with one unifying goal – redefine the meaning of success in business. You can just imagine how excited I was to spend my money with a company like New Leaf. 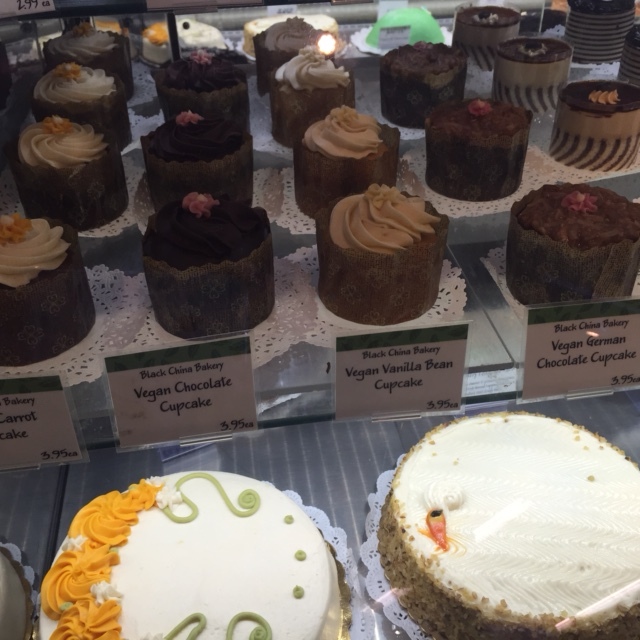 After browsing through their wonderful bulk section, I headed over to their bakery which is known for its vegan-friendly options. I did already mention that I like to eat on my vacations, right?! Once again, Whole Foods needs to step up their game when it comes to their vegan bakery choices – my local store has one chocolate mousse cupcake that is made with genetically-modified beet sugar and enriched wheat flour and rates about a 3 out of a 5 in flavor. The Half Moon Bay New Leaf offers four different vegan cupcakes – vanilla, carrot cake, chocolate and German chocolate. The cupcakes are provided by Black China Bakery – a family-owned wholesale bakery based in Santa Cruz. Since I was on vacation and I could not decide and I was comfortable with their list of ingredients going into my body, I chose the chocolate and German chocolate cupcakes and Steve went for the vanilla. Hands down the chocolate beat out the vanilla. And winning a very tight race, the German chocolate inched out the chocolate cupcake. That extra bit of coconut put it over the top! Oh yeah, and I found a place for lunch too. 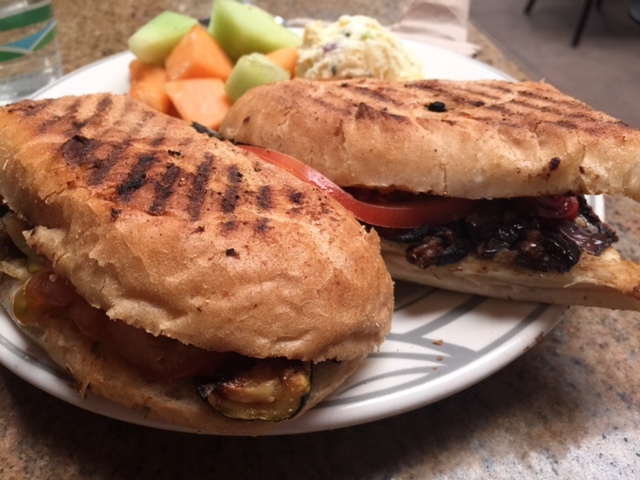 Moonside Bakery & Café offers four vegetarian sandwiches that with a little adjusting can be vegan-friendly. I had sandwich #1 the Roasted Veggie – delicious sweet French baguette, topped with grilled eggplant, bell peppers, Italian squash, garlic and tomato with a drizzle of balsamic dressing (ask them to hold the cheese!). I’ve been eating these vegetables for years and this was still one of the tastiest sandwiches I’ve ever had. Definitely, worth the stop! With my belly full of veggies and cupcakes, I got back on the road. Vegan cupcakes make me smile! Yes, it tastes even better than it looks and it looks dang delicious! I have to admit that I did not make it very far! 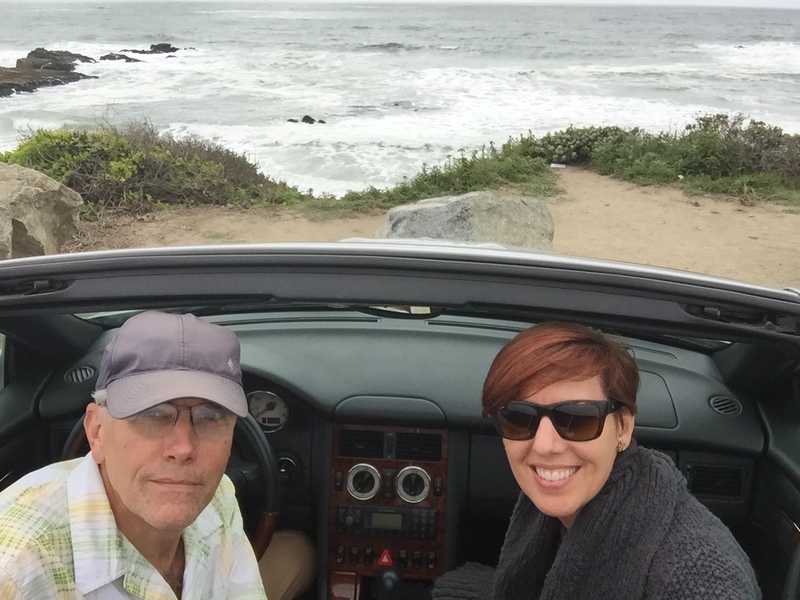 15 miles from Half Moon Bay I pulled into the Pescadero State Beach. I am not knocking the beauty of where I grew up – near Lake Superior as a small child and then Lake Michigan as a teenager. Stunning, really. As an adult, I lived along the Atlantic Ocean near some of the best beaches from Florida to Virginia to North Carolina. And maybe that is why I am still so in awe of the Pacific Ocean. Its ruggedness and stark beauty is so different from what I am used to. 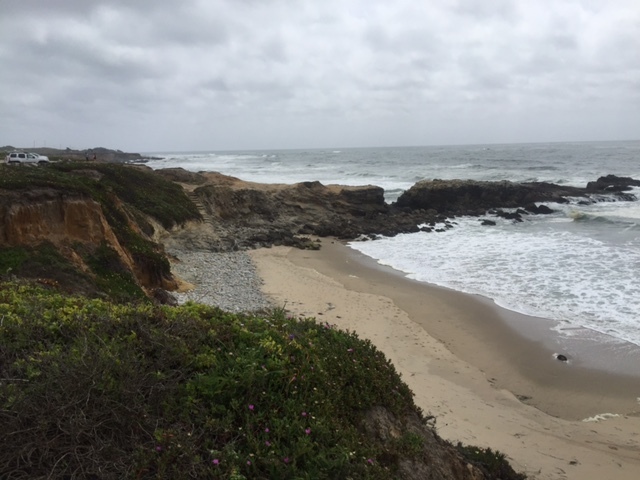 Pescadero Beach is a mile-long shoreline with sandy coves, rocky cliffs, tide pools and picnic areas. 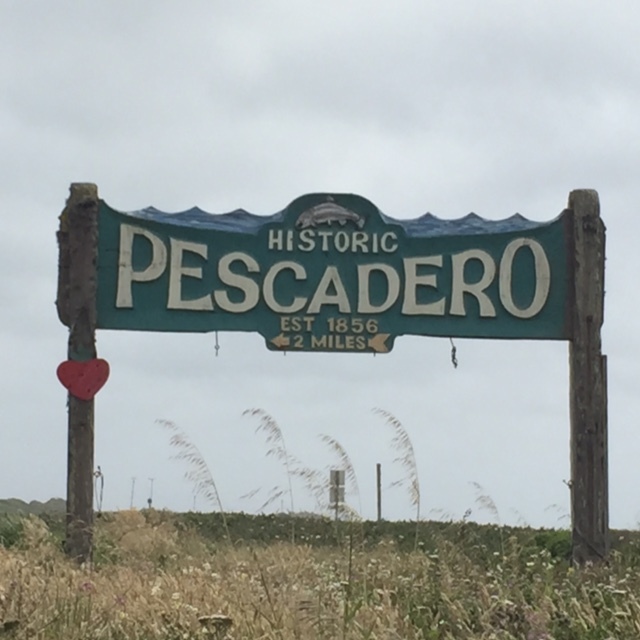 Just across Highway 1 is the Pescadero Marsh Natural Preserve, which offers refuge to blue heron, kite, deer, raccoon, fox, skunks, barn swallows and weasels! A perfect spot for bird watching and just enjoying all the life nature has to offer. One caveat…always bring a jacket! I also have to admit the beauty drew me in but I also remember John Connor in the 1991 Terminator 2 movie telling his friend that his Mom, Sarah, was locked up in the Pescadero State Hospital for the Criminally Insane. I have no idea how that stayed with me for 25 years but it did! 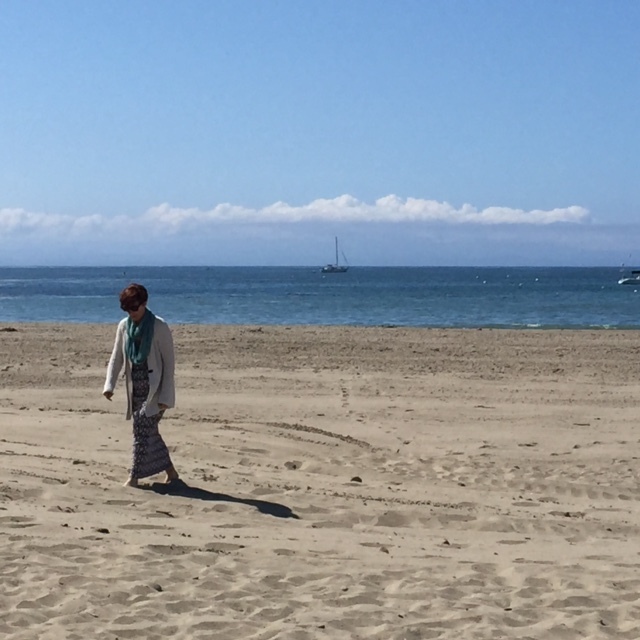 And then, ahhh…Capitola. 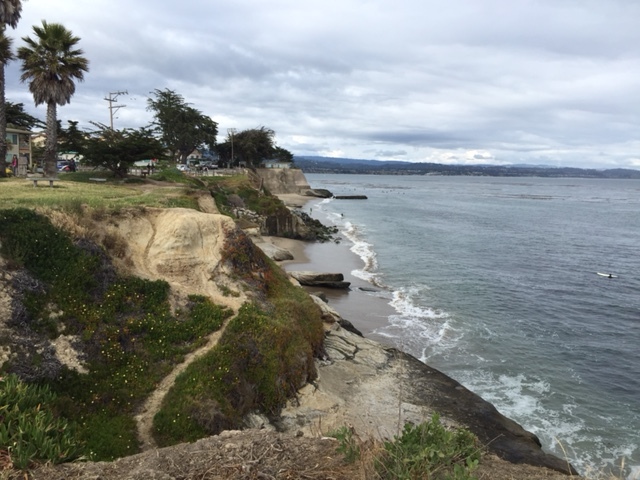 Besides its quintessential beach town feel, Capitola has some great history. It is built on the location of an Indian village that existed for more than 1000 years! Sadly, the Soquel Indians were relocated to the Mission Santa Cruz when the Mission was established in 1791. California became a state in 1850 and Capitola-by-the-Sea became a resort town in the 1860s. In the 1920s, bungalows and stucco shacks started popping up reminiscent of small Italian fishing villages. O’Neill, world-famous for its surfboard and wetsuits is headquartered here in Capitola. And Sunset Magazine lists Capitola-by-the-Sea as one of the top fourteen unsung beach towns. So, shhhhhh…don’t tell anybody! Looking out to the Pacific! 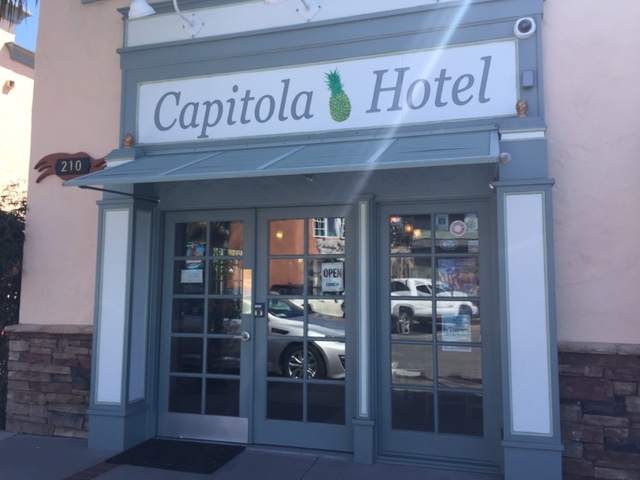 Capitola Hotel is a cozy boutique hotel with just 10 rooms located at 210 Esplanade in the heart of this quaint village. The hotel is surrounded by shops, restaurants and bars and is a quick walk to the beach and the Capitola Wharf. It is really a perfect location. The rooms have free Wi-Fi, a fridge for leftovers (I had lots!) and a ceiling fan so I felt like I was in the Caribbean. The bathroom has nice thick cotton-bamboo towels and eco-friendly shampoo, conditioner and lotion. The types of things I appreciate in a hotel! They also have a tiny little private courtyard full of flowering vines and a water fountain. One evening while sipping some vegan wine I brought along, I got to enjoy several different species of bird fly past me to drink out of the fountain. It was magical. A lovely little spot! After getting all settled in and putting my toes in the sand, I walked along Wharf road about a half mile to the vegetarian restaurant Dharma’s. Dharma’s menu is organic and vegetarian with a new gluten-free menu. Almost everything on the menu either already is or can be made vegan. Just ask! Marco, one of their vegan chefs, also makes an amazing vegan bacon ranch dressing. The meals are enormous so be prepared for leftovers or do what we did on our second visit -share an entrée! Dharma’s is a very low-key, casual eatery with a huge dining room and a few outdoor tables. It is located in a small shopping center and doesn’t offer any wait staff. But the food is consistently good, the portions are extravagant and the prices are right! We split this and still had leftovers. Dinner was even more enormous! 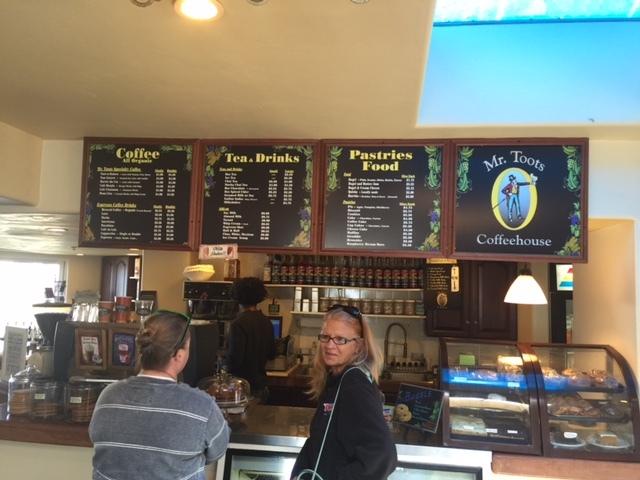 If you are looking for a good coffee shop that offers almond and soy milk and delicious vegan baked goods, Mr. Toots is the place to go. 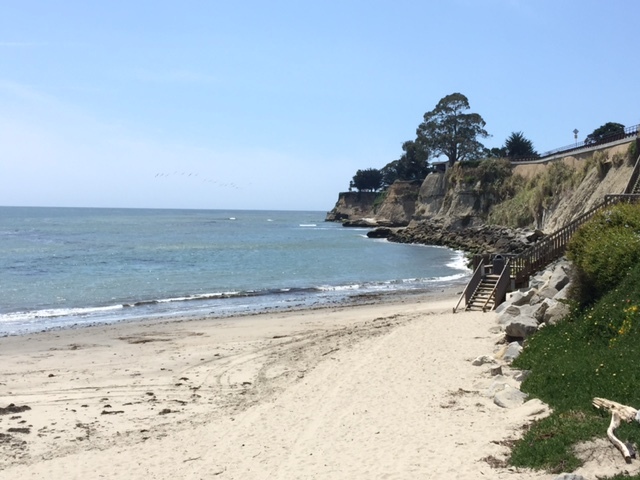 It is conveniently located right across Esplanade from Capitola Hotel. Head upstairs to the second floor to a large coffee shop with a tiny patio overlooking Soquel Creek and the Pacific Ocean. 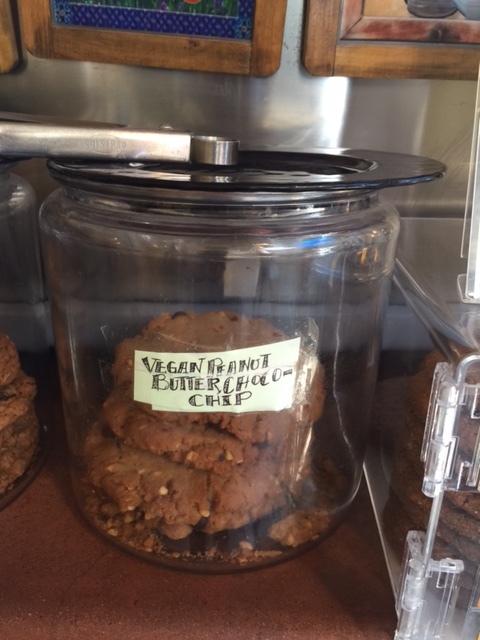 The vegan sweets include a huge peanut butter chocolate chip cookie and a raspberry dream bar. The cookies are made by Kerri’s Kreations, a local wholesale baker for the past 20 years who also provides baked goods to the local New Leaf Markets. She takes her ingredients very seriously using only organic, GMO-free grains, flours, nuts and fruits. She only uses sustainably sourced organic Spectrum palm oil shortening. Her chocolate chips are Fair Trade USA & Rainforest Alliance Certified. The organic pure bourbon vanilla extract is fair trade as is the coffee. She evens grinds the fresh Sri Lankan cinnamon herself! In addition to all this awesomeness, she also recycles about 80% of her waste and regularly donates cookies to non-profit organizations in her community! I’m so proud of all the cookies I ate while visiting Capitola. Delicious and good for my soul! In between all my eating, beach walking and relaxing I also made time for a little bit of shopping. Capitola Village has a couple blocks of shops and galleries intermingled with the restaurants. 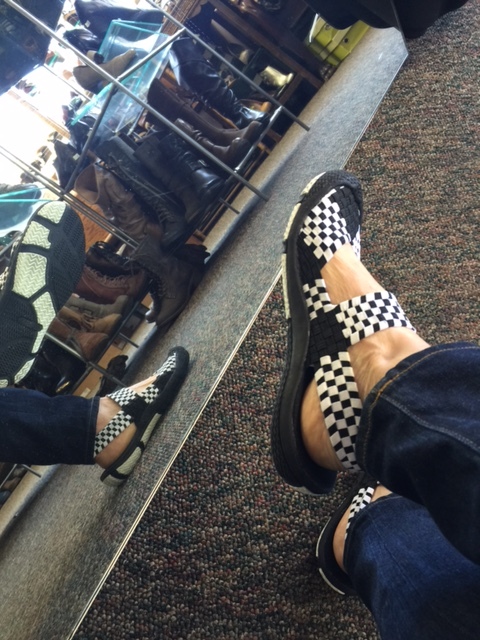 If you are looking for casual, resort-style vegan shoes, visit Hot Feet (for women) and The Big Kahuna (for men). I found the cutest pair of Zee Alexis by CC Resorts. The shoes are designed by a former designer for Donald Pliner but are comfortable and vegan! They have a thick layer of memory foam that is at least 7 mm thick and is oh so comforting to my foot. The soles are made with a rubber-like EVA which offers shock resistance and are exceptionally light. It wasn’t exactly love at first sight but I fell in love when they touched my feet! Steve could not be left out so we visited the sister store located right next door – The Big Kahuna. 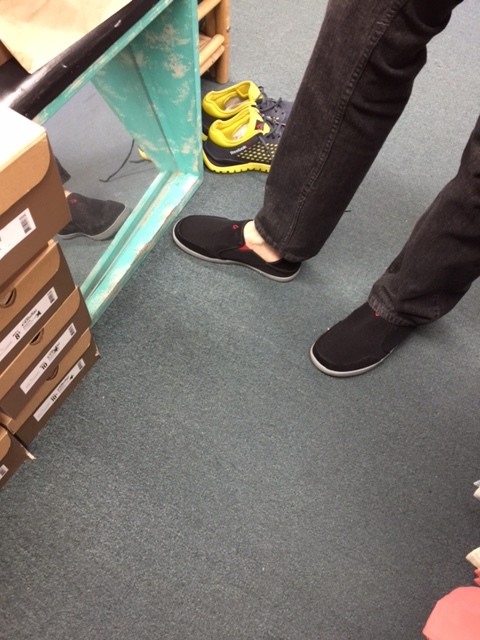 He found a pair of Olukai mesh slip-ons that are perfect beach attire. Cute, check. Comfy, check. Vegan, check! Santa Cruz is right next to Capitola and their thriving downtown is only about 5 miles from Capitola Village. 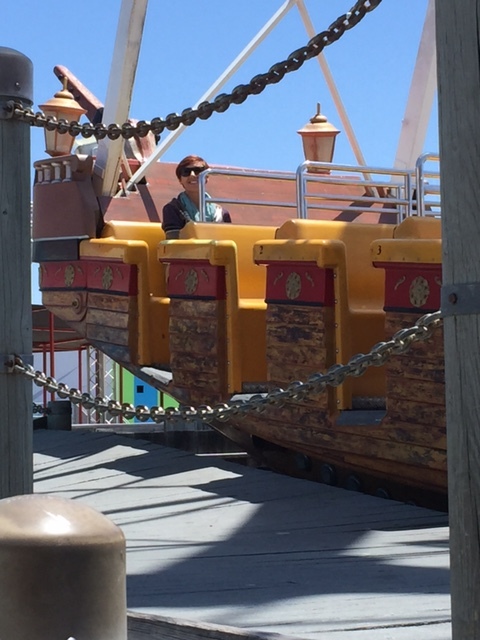 Since the 1987 hit The Lost Boys filmed at the Santa Cruz Boardwalk, I knew I had to spend a little time there. 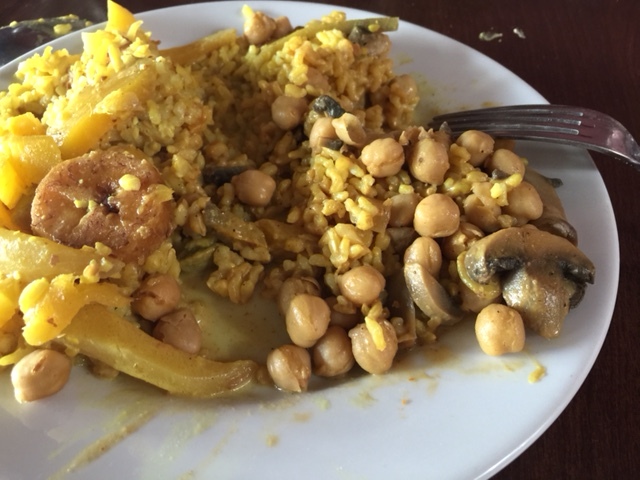 Santa Cruz also offers more vegan-friendly restaurants especially in its downtown area. To name a few, Santa Cruz has a Café Gratitude known throughout the Bay Area for its vegan and raw menu. Saturn Café is also well-known in the Bay Area for their funky décor and vegan diner-like comfort food. And a couple local restaurants include Malabar, an industrial-chic spot that serves Asian-fusion entrees and Pearl of the Ocean, serves Sri Lankan fare using organic and locally sourced ingredients and offers many vegan options. 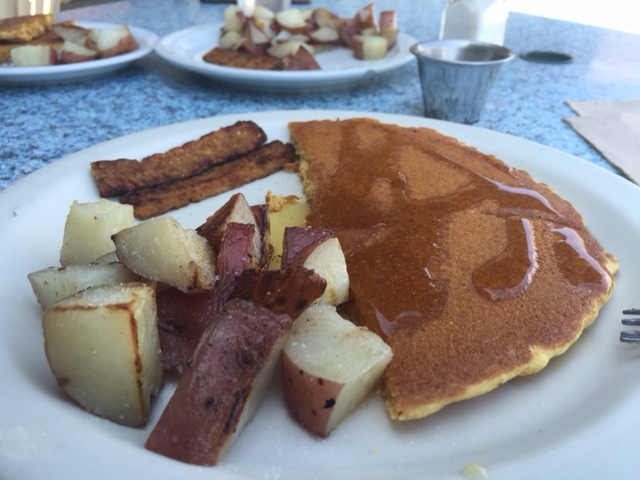 I had the opportunity to dine at Saturn Café twice – both times for breakfast. My steady diet of organic oatmeal, almond milk & fresh berries fuels my day almost every day so because of that I really enjoy going out for breakfast when I am on vacation! 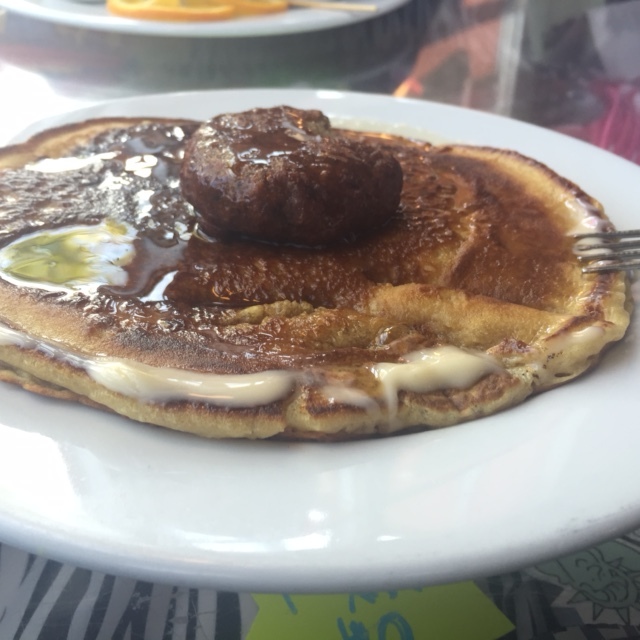 The pancakes were very tasty but what really impressed me is their vegan housemade “sausage” patty. It is incredible! If you love to Yelp like I do, you will receive a 20% discount on your meal just for checking in. Malabar gets mixed reviews from me. Much of what is on their menu is vegan-friendly and the curry dish and lentil dosas were just amazing. The food was probably a 4.5 but the service and ability to communicate left much to be desired. If you go in with the proper expectations, the food makes it worth the trip! Vegan pancake & house made sausage. Yep, I had the other half for dinner! 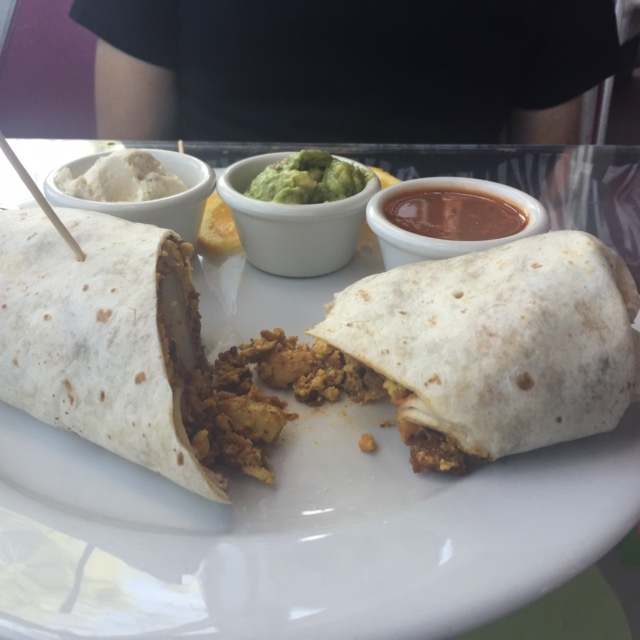 Breakfast burrito – Steve raved about it! 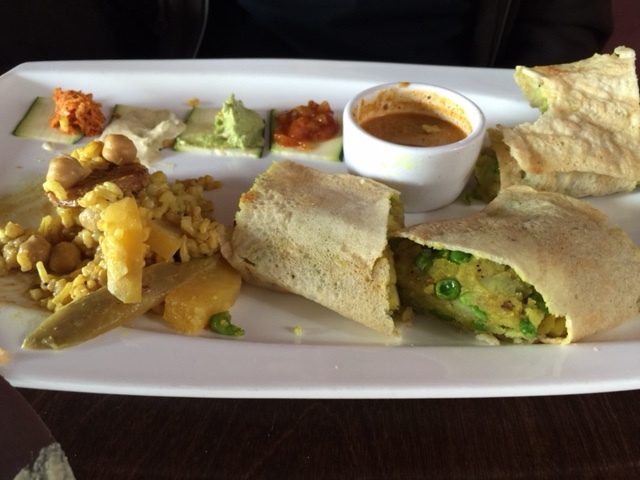 Lentil Dosa with several sauces & chutneys! Oops, started eating it before I got a photo. It was that good! Malabar’s mango curry dish was delish! I cannot leave out my experience on the Boardwalk. I visited in mid-May so the Boardwalk was just reopening for the season. 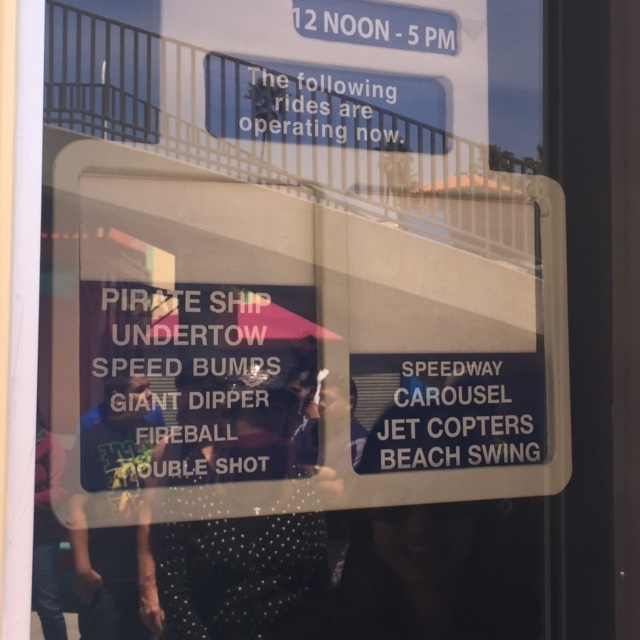 Only a few of the rides were open for business and they offered abbreviated hours from Noon – 5. Many of the restaurants were not open which is no big deal to us vegans. To put it bluntly, it is not vegan-friendly and there are NO healthy food options. Do what I did, eat before you go to play! 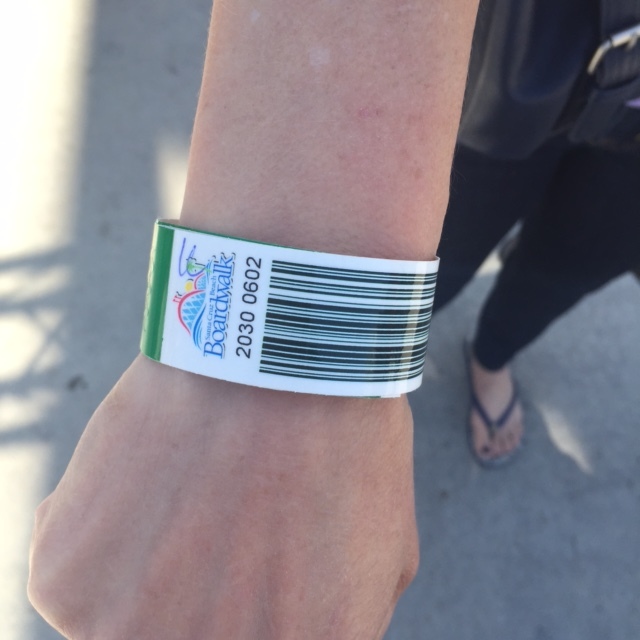 Because of the limited options on games and food, the charge to go on the rides was deeply discounted and there were absolutely NO lines. In fact, several times I was the only person on the entire roller coaster. It was really cool. And if you can keep your eyes open while screaming your head off, the view of the Pacific was absolutely amazing. I made a good decision and instead of watching any of the rides I just jumped on them – first the terrifying Double Shot, next an outer seat on the stomach dropping Pirate Ship, then the fun & exhilarating UnderTow, followed by the neck snapping wooden Giant Dipper coaster and last the curdling scream inducing Fireball (to see the video visit my Facebook page – yeah, the person screaming over the Beatles song was me!). And this word of advice – the bumper car ride Speed Bumps is actually really lame when there are only 2 of you on it! Every year the Boardwalk kicks off its annual season by showing the movie that made it famous (famous to me anyway) – The Lost Boys. Not many rides but I didn’t care! Blood curdling screaming came from me! Pirate Ship looks deceptively calm. It is a lie! 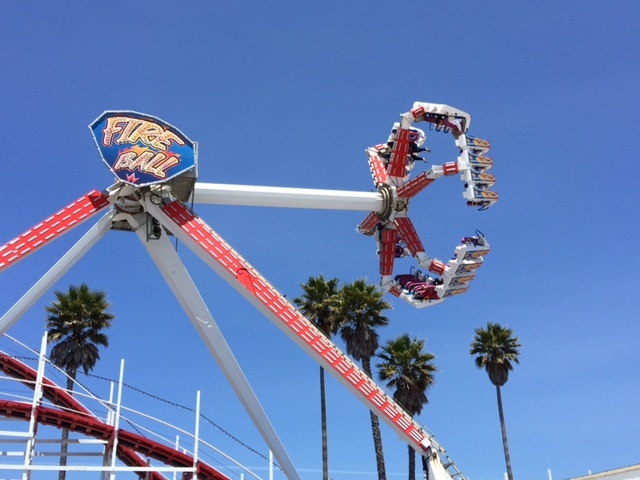 Once I got off the Fireball, I was so dizzy that I almost fell down and was starting to feel a bit queasy. It seemed the perfect time to visit the Santa Cruz Wharf. The Wharf just celebrated its 100th birthday and is covered with bars, restaurants and shopping. Not very vegan-friendly but the beer I ordered from Fire Fish Grill went down just fine! The bar is big, the bartender friendly and the place doesn’t smell like fish. The most exciting part of the Wharf is the huge community of sea lions. Just amazing. There were dozens of them lined up on the boat docks sunbathing and sleeping. Once in a while there would be a minor scuffle for space and a little bit of chatting between them. It was really lovely to see them all up so close in their natural habitat. 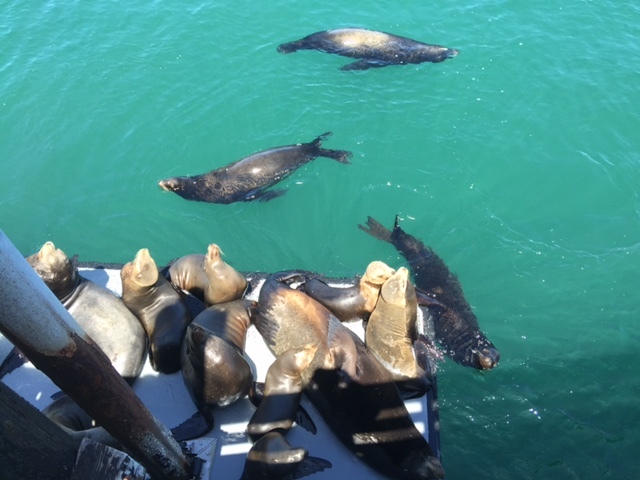 Visiting the sea lions when you are in Santa Cruz is a must-do! 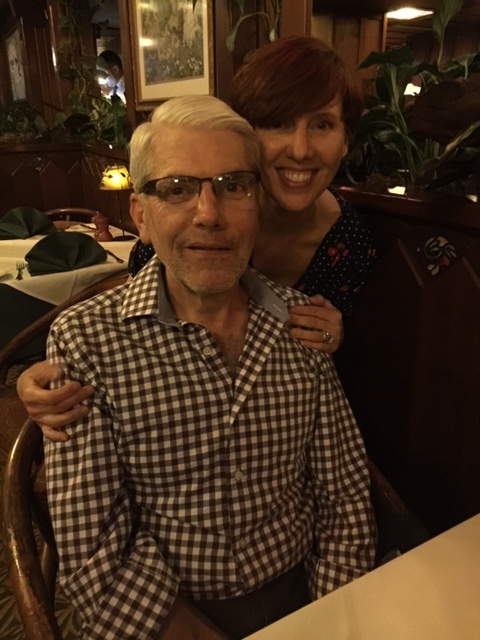 The staff at Capitola Hotel and several friends suggested that we also visit Shadowbrook restaurant in Capitola for a very special experience. Shadowbrook is located a very easy walk from Capitola Hotel but they also offer free shuttle service within a 3 mile radius if you want to wear your stilettos. 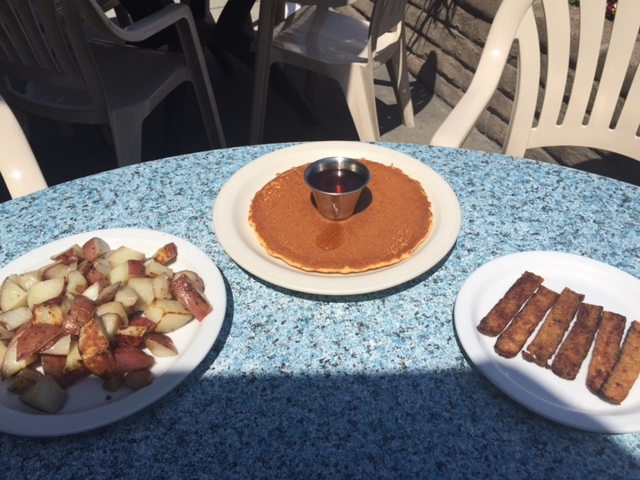 Shadowbrook has been serving the guests and residents in Capitola since 1947. That is 68 years! 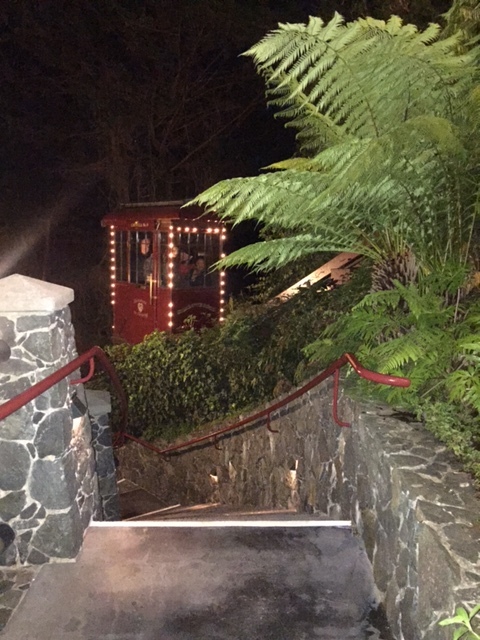 It is located along the lush Soquel Creek and is reached by a quaint old cable car. I rode the cable car down which was fun but the meandering paths are something that should not be missed. It is just beautiful! Though it has won awards as being a very romantic restaurant, with their outdoor seating either full or closed that evening, there was nothing romantic about the experience. 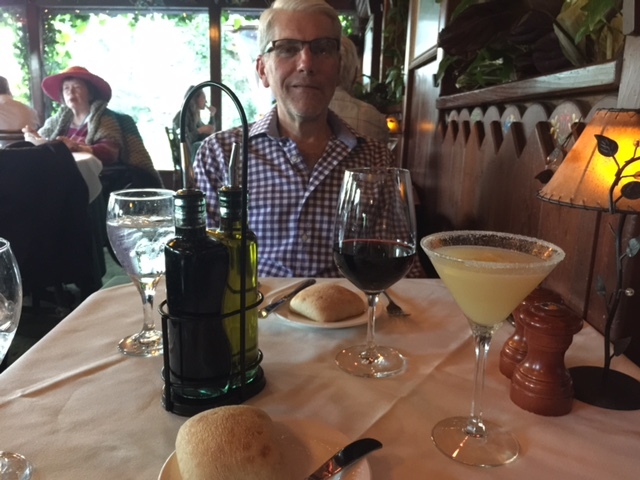 The service was world-class, the food and drinks delicious and I had an amazing experience. Shadowbrook offers three vegan entrees, 1 vegan appetizer and many of their salads can be “veganized”! 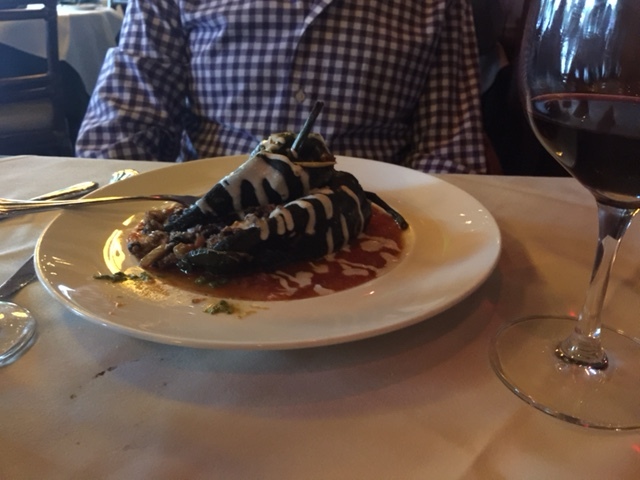 I absolutely loved the Eggplant Agnolotti and Steve raved about the Roasted Poblano Chiles. Their vegan-friendly fresh bread was served with EVOO and balsamic instead of the usual butter. When I made the reservations through Open Table, I mentioned that I was hoping for a vegan dessert option. And the chef kindly created a delicious vegan sorbet using fresh, in season strawberries. This is a very special place and should not be missed when visiting Capitola. 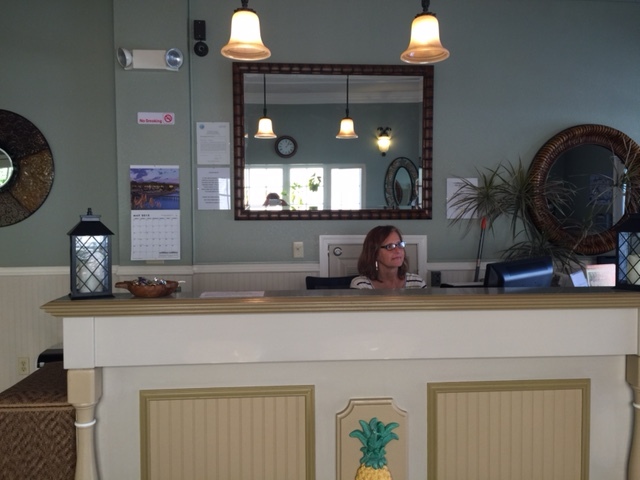 If you are lucky enough to sit in Alison’s section, she is lovely and provides incredible service. Another must-do! 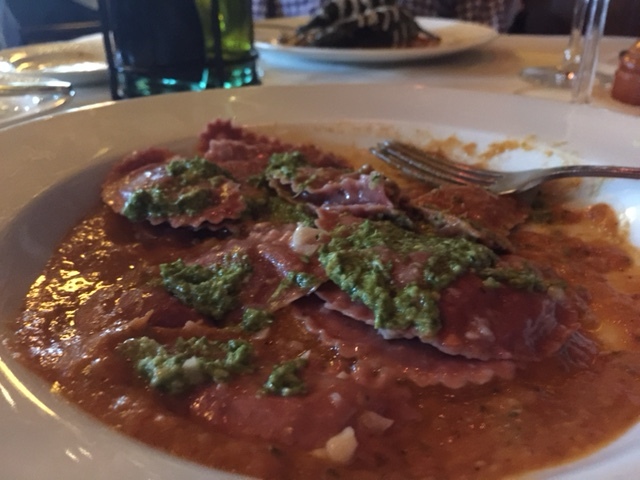 Eggplant Agnolotti – was even better the next day! Pear martini made with pureed pears! Took the cable car down & the enchanting pathway back to the top! I cannot leave out the draw and beauty of the Pacific. 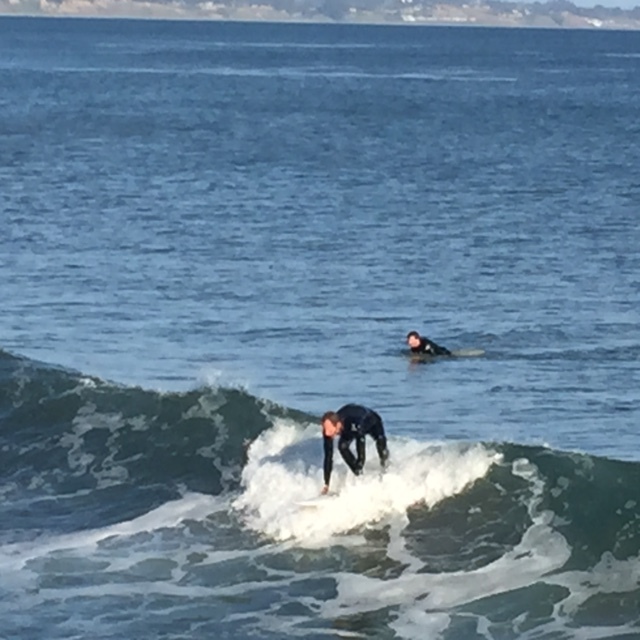 The tiny village of Capitola is a surfer’s paradise. The surfers arrive in the morning and stay until nearly dusk. I found myself watching them surf and lost all track of time. 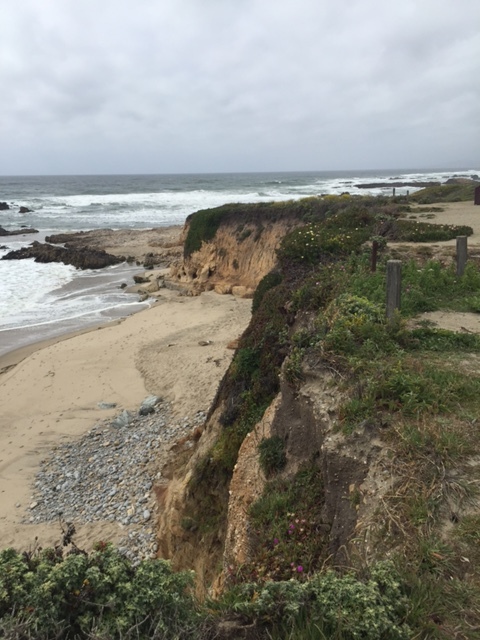 While out exercising one day, I walked to the Pleasure Point surfing area. The water was full of surfers and one or two SUPs joined in for the fun too. This is one of Northern California’s best breaks with waves perfect for just about every type of surfer 320 days of the year. I know watching made me want to take up surfing at 45! Exhilarating to watch! On my walk back to the Hotel, I walked along the Capitola Wharf and got to spend the next half hour watching a Mama Sea Otter feed and care for her baby Otter (click on otters to watch the YouTube video). They were just so lovely to watch and the baby Otter is quite possibly the cutest little animal on earth! What an unexpected surprise. And though some of the locals mentioned recent whale sightings, I was very pleased with my sea lion/sea otter interactions! It was an amazing 5 days that I will remember always. 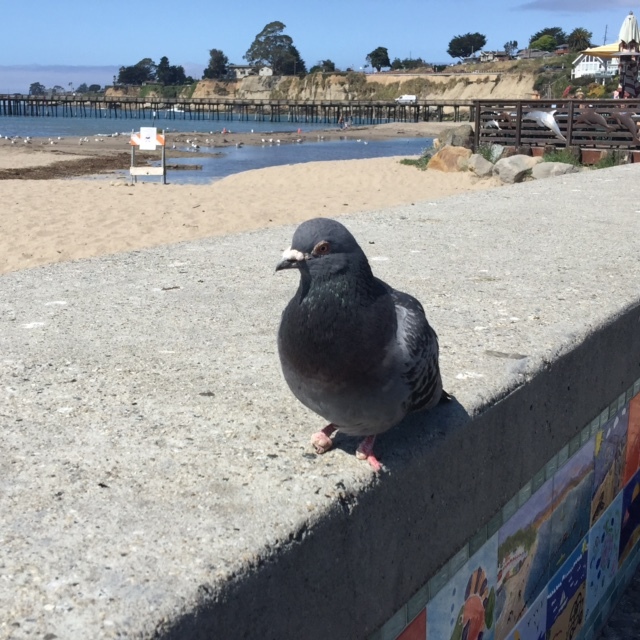 The village of Capitola is sweet, Santa Cruz’s downtown is hip, the Boardwalk is just plain fun and the openness to vegan-friendly food is wonderful. I ate, relaxed, screamed a bit, had some fun and reconnected with the love of my life. I’d say that was a very successful vacation! Thanks again for joining me and as always…eat, drink and be vegan. Bye Capitola. I will see you again! Good-bye Pigeon, I miss you already! City Winery - The Star That Michelin Forgot! 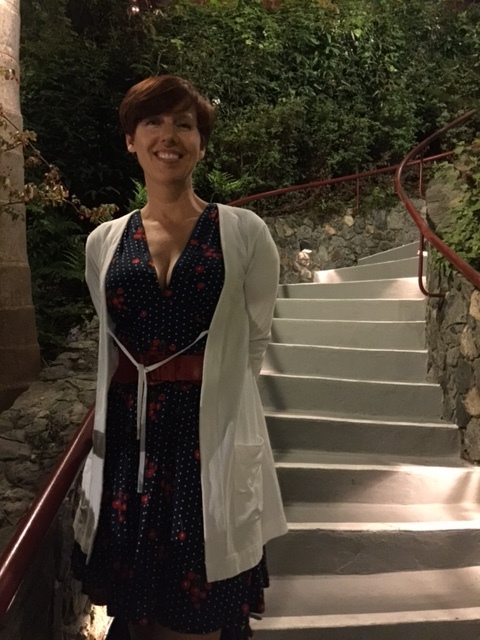 Napa Valley Vegan Celebrates 1,000 Followers!